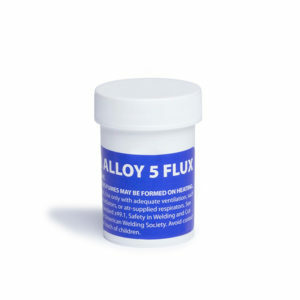 Muggy Weld frequently receives emails regarding aluminum boats–specifically how to repair leaky aluminum boat rivets. Fortunately, we have the answer: Super Alloy 5 and an oxyacetylene torch. Rivets are used on aluminum boats because there is a head on each end of the installed rivet and they establish a very tight fit, allowing the boat to remain water-tight. Over time (and use) the aluminum flexes and springs back repeatedly to accommodate loads and impact, eventually causing rivets to fail and leak. In this video, a customer purchased an aluminum boat riddled with holes. The previous owner had applied epoxy in an attempt to repair the holes and leaky rivets in his aluminum boat, and was unsuccessful, as silicon/epoxy is a temporary fix to an ongoing problem. The first step in repairing this aluminum boat’s holes and leaky rivets was to use an angle grinder with a sanding disc to remove the silicon. (A wire wheel or wire brush is also acceptable). After removing the residual silicon, Muggy Weld’s Super Alloy 5 rod and flux was applied with an oxyacetylene torch with a size 1 tip. The resulting repair is now water-tight and air tight, and the area surrounding the rivet will no longer flex with use. 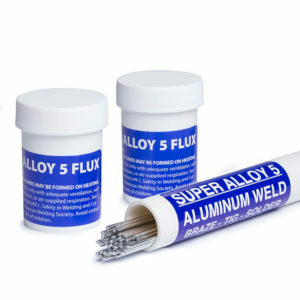 Aluminum boat rivet repair can be easy, fast, and permanent with Super Alloy 5 aluminum rod and flux.